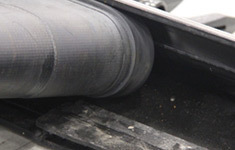 The MacDon FD75 FlexDraper® is our latest innovation in FlexDraper technology. Even at maximum flex our fixed reel to cutter bar relationship stays true, maintaining a consistently small critical gap between the reel fingers and cutter bar. This close reel to cutter bar relationship results in smooth, consistent, heads-first feeding that significantly boosts combine productivity. That means you get up to 45′ (13.7m) of true ground following characteristics that won’t compromise performance. SMOOTH, CONSISTENT, HEADS-FIRST FEEDING. IT’S WHAT SETS OUR MACHINES APART. Conforms to the ground with minimal ground pressure. Can be easily and quickly locked into rigid configuration. The C-shaped cutter bar promotes smoother crop flow with one of the industry’s shortest transitions from cutterbar to the draper. 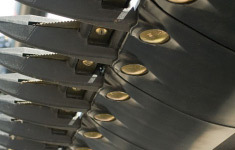 Even in shatter-prone crops, it maintains a tight draper to cutter bar seal for better harvest performance. 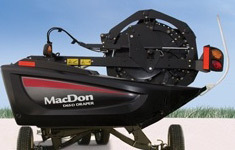 The MacDon FD75 FlexDraper® features a fixed cutter bar to reel relationship. 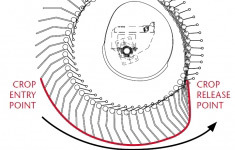 This means a small critical gap between the reel fingers and the cutter bar is maintained at all times, even when in full flex. This small gap ensures smooth, consistent, heads-first feeding of the crop over the entire width of the FlexDraper® Header, up to 45′ (13.7m). 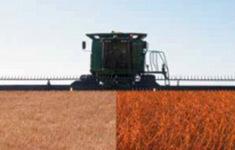 That’s innovation significantly boosting combine productivity. 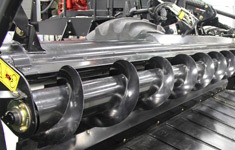 The MacDon FD75 FlexDraper® is a floating, three-section flexible header with a split reel allowing the entire header frame, cutter bar and reel to follow ground contours as a unit – while maintaining the small, consistent reel to cutter bar relationship. This is important for smooth, consistent, heads-first feeding to the combine – even at maximum flex. This means excellent ground following capabilities even on terraces or ditches. On the other hand, the other guys’ rigid frame relies on the movement of the flexible cutter bar to follow ground contours. 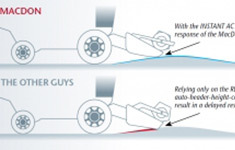 To accommodate the flex, reel fingers must have excessive clearance to avoid damage from the cutter bar. This results in a large gap and inconsistent relationship between the reel and cutter bar as the cutter bar follows contours in the field. This simple change allows the drapers to be tensioned up to 33% more than previous FlexDraper headers, improving the drive to drapers for handling the heaviest of crop loads. This kit is available for all header sizes. 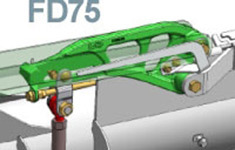 A spare knife can be ordered and installed into the back-tube of any size of FD75 header at the factory. 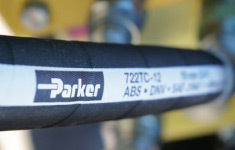 By using high quality Parker hoses throughout the FD75, we have been able to provide the most reliable FlexDraper to date. The FD75 FlexDraper® switches easily from flex to rigid application with the quick flip of a lever. This amazing feature allows the FD75 to provide outstanding performance in just about any crop and under any ground condition. 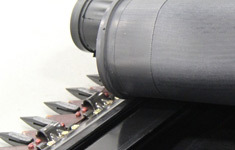 Available in 30′ (9.1m) to 45′ (13.7m) widths, making this the most productive Draper Header that MacDon has ever produced. 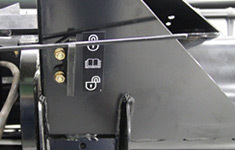 Convert your FD75 from rigid (lock) to flex (unlock) in seconds. It is really that simple! Many of the complicated weldments have been replaced with castings. This simple change allows for a more repeatable product – which in turn makes your product last longer than ever before. The FD75 FlexDraper® Comes Almost Fully Loaded. 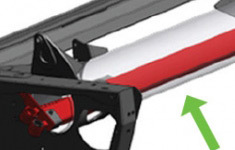 Although the FD75 FlexDraper® comes standard with many items, some kits might be required to complete your header for the conditions you face on your farm. Any of the following items can be added to your machine to allow it to perform as you like it. 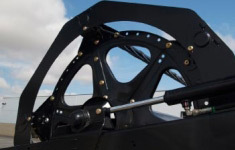 The Stabilizer Wheel Kit is ideal for cutting off the ground, by stabilizing the header in undulating ground conditions through the use of spring & shock combination. 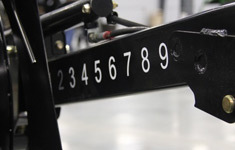 The cutting height is fully adjustable and can easily be set to a number of cutting height positions. This kit can be used on 30’ (9.1m) and larger headers. 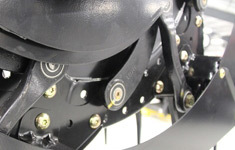 Attached in front of the back tube, the upper cross auger improves feeding of tall, fluffy crop to the center of the draper header. This kit is ideal for straight-cutting high volume crops like canola, mustard and other tall hard to feed plants. This kit can be used on all sizes of headers and are lenght specific (full width of each header size). This kit is useful when cutting low to the ground. It acts as a touch-down point when operating on rough or undulating ground. 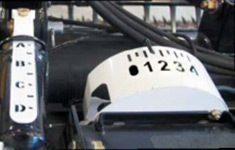 There are two seperate packages available – Inboard* (black compression molded) and Outboard Skid Shoes (steel with white poly). 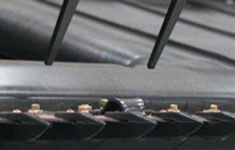 The skid shoes are adjustable for without the use of tools. 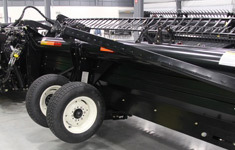 * 30′ Draper Headers require only one set of Inboard Skid Shoes while 35′ and larger headers require 2 sets. 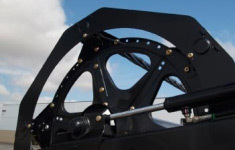 This kit will allow you to transport your draper header from farm-to-field and then quickly switch to field Stabilizer Wheel position by one person. 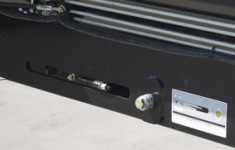 The Transport Package is a simple self-supporting unit with very little hitch weight for simpler hitching. The tranpsort towpole is a two peice unit that requires no tools to assemble / dissasemble and stores on the back tube of the header during harvesting operation. The Stabilizer Wheel application is ideal for cutting off the ground, by stabilizing the header in undulating ground conditions. 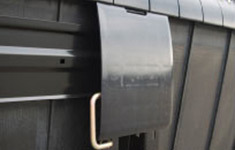 Each MacDon Combine Draper Header comes standard with a combine adapter package to fit a specific brand of combine. Should you decide to change combine brands down the road, we offer this kit to allow you to modify your existing header / adapter to fit that different combine brand. It’s simple and only takes about 4 hours to complete the conversion. * This kit is required to convert your existing header from one combine brand to another. You will not need this when ordering a new header.